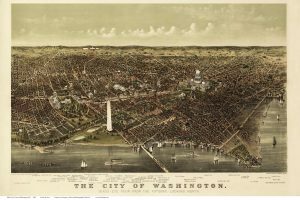 This fall semester, the lecture series “Moscow-Washington: Capitals of the Cold War Past and Present?” explores the history of Russian and American relations through the lens of each country’s capital city, how their histories have become entangled, and how they have followed different paths. With their origins in very different national and local histories before the 20th century, Moscow and Washington suddenly intersected during the Cold War as the metropoles of two global, entangled empires that displaced those of Western Europe after World War II. Over the next four decades, these two cities grew in tandem as urban centers showcasing their political values and socio-economic systems to the rest of the world, while simultaneously denying their status as empires and hiding many of their state secrets, methods of fighting the Cold War, and even their social failings within their very urban fabric. Frequently lost in discussions of relations between “Moscow” and “Washington” are the cities themselves, their urban geography and architecture, their subway systems and infrastructure, their musical and literary scenes, ethnic and racial tensions, and the everyday lives of their residents. This lecture series recaptures the urban history of these two metropoles and asks what they can tell us about the broader state of Russian and American relations past and present, which have arguably constituted the most consequential international relationship for both countries from the early 20th century to the present. The series will feature five scholars who will give lectures on their city of expertise according to the schedule below. All lectures are open to the entire UMW community. Maria Rogacheva. Tuesday, September 25, 6:00pm, Monroe 346. Lecture title, “Fighting the Cold War on Moscow’s Periphery: Scientific Communities and the Rise of the Soviet Superpower.” Author of The Private World of Soviet Scientists from Stalin to Gorbachev (Cambridge: Cambridge University Press, 2017). Maurice Jackson. Date TBA. Lecture title TBA. Co-author with Blair Ruble of DC Jazz: Stories of Jazz Music in Washington, DC (Washington: Georgetown University Press, 2018). George Derek Musgrove. Tuesday, October 23, 6:00pm, Monroe 346. Lecture title TBA. Co-author with Chris Myers Asch of Chocolate City: A History of Race and Democracy in the Nation’s Capital (Chapel Hill: University of North Carolina Press, 2017). Stephen Bittner. Tuesday, November 6, 6:00pm, Monroe 346. Lecture title TBA. Author of The Many Lives of Khrushchev’s Thaw: Experience and Memory in Moscow’s Arbat (Ithaca: Cornell University Press, 2008). Andrew Friedman. Tuesday, November 27, 6:00pm, Monroe 346. Lecture title TBA. Author of Covert Capital: Landscapes of Denial and the Making of U.S. Empire in the Suburbs of Northern Virginia (Berkeley: University of California Press, 2013).